Retailers, in the midst of transformational change, are eager for insights and solutions from their suppliers—and they will reward those that can deliver. 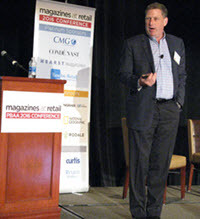 Because of its unique attributes, the magazine category has unique opportunities to assist retailers and drive category sales by offering retailers solutions to several macro issues that are shaping their 2020 strategies, according to Bryan Gildenberg, chief knowledge officer at Kantar Retail. Gildenberg stressed that unplanned, incremental sales are where retailers make nearly all of their profits. Magazines are not only an impulse category, but are pre-priced and quite price-insensitive—making them doubly valuable to retailers, he said. Another key variable for retailers is that, in ranking what’s most important when shopping, consumers now rank “having a stress-free shopping experience as possible” third—below getting a good deal and spending as little money as possible. Magazines are already helping retailers by offering entertainment at the most stressful part of the shopping trip—the checkout—Gildenberg pointed out. And as in-store media, they should be positioned to make shoppers’ trips more enjoyable through outposts and by delivering content through mobile in-store connections, as well. Thanks in no small part to increasing online shopping in a growing number of product categories, the number of different brick and mortar stores that consumers shop per month has declined from 12.5 in 2007 to 9.5 in 2015, he reports. That means that any category that can help drive consumers into a specific store—that is, help that retailer be included in shoppers’ “portfolio” of chosen stores—is invaluable, he said. Research has shown that the availability of their favorite magazines at a store is important to magazine buyers (who tend to be affluent and spend more/buy bigger baskets), and that many shoppers will go elsewhere if they cannot find their favorite titles in a store. Today, Americans are polarized by geography, income, ethnicity and generation. Retailers are struggling to find cost-effective ways to target and serve all of these specialized audiences, he said. Magazines already serve virtually every specialized audience imaginable, and could also work with individual retailers to target audiences, making them a cost-efficient platform—or “turnkey solution”—to help retailers address polarization. “Currently, this is the single biggest missed opportunity for the [magazine] category,” Gildenberg said. Going forward, retailers’ growth will come through optimizing the performance of smaller stores, and they will be making hard decisions about their positioning and assortments. Many categories will be downsized or dropped, depending on a retailer’s strategy. Gildenberg notes that, while smaller stores likely mean that magazines will not have the large traditional mainline displays to which they’re accustomed, they are well-positioned to be displayed in smaller, portable and still-visible types of displays in a variety of synergistic areas throughout the store. Referring to the “zero moment of truth,” or ZMOT—the stage in the buying cycle where consumers are researching a product—Gildenberg stressed that bricks and mortar retailers are in great need of solutions for keeping consumers from researching on Amazon or other e-tailers while they’re in stores.